The book opens on 5th August 1988, 21 days after. We meet a heavily pregnant Linda Sadler who is trying to come to terms with a loss and feeling isolated. We then discover that this loss is that of her three-year-old daughter Phoebe who has died in a tragic accident, but we are left to wonder what actually happened as this is not revealed until near the end of the book. Over the course of the next half of the book, we follow Laura, her husband Tom and her older daughter Esme as they each try to deal with their grief separately. Linda also gives birth to a beautiful baby girl, Beatrice (Bea). However, there is no love from Linda to Bea, she feels cold towards her new daughter, a daughter she wishes she could have aborted. The second half of the book opens 25 years later and the youngest daughter, Bea is now pregnant. Bea left the family home years ago as it wasn’t easy being the child that obviously wasn’t wanted. Bea decides that it is time to go over old ground and in this section the family eventually open up about their feelings and what actually happened on that fateful day. 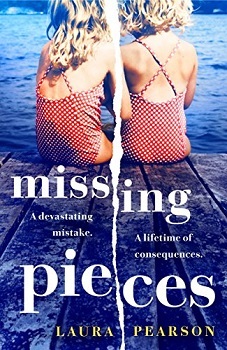 There’s no doubting the fact that Laura Pearson’s Missing Pieces is poignant, heart-breaking and raw. It will have you reaching for the tissues on more than one occasion. This is Ms. Pearson’s debut novel and I think she has done a wonderful job. The writing was superb, there was enough detail to keep me intrigued as to what when on and the characters all had their own unique qualities and all perfectly realistic. It did feel at times that Linda was very selfish, but unless you have been in the grieving process you can’t understand how hard and vulnerable it can make you feel. Also, everyone grieves differently and some do push others away, sadly. I found I related more to the first half of the book than the second. Perhaps because I found this more interesting as in character building and the suspense and mystery surrounding the circumstances of Phoebe’s death. Whilst I believe that there is no greater pain than losing a child, the build had me expecting something different to what actually occurred. Don’t get me wrong, I wasn’t disappointed, I just expected there to have been more to Phoebe’s death. This is a beautiful book that deals with life, bereavement and how those that are still living learn to deal with their grief in their own way. I actually sat and read this in one sitting as I was that engaged with the plot. Thank you for the honest review. This book sounds like a heavy read but I am interested. You’re welcome. It’s not that heavy but is quite raw. Wow this sounds intense. I might have to pick this one up! You should give it a read, it is worth it. Wonderful review. It sounds like this would put my heart through the wringer. Wow, sounds like an ugly cry waiting to happen. Great review. If you are a crier, this will certainly make you ugly cry. Definitely a book that will make me cry! Great review! Thanks. If you are a crier it will. I can even imagine losing a child. It would be heartbreaking. I enjoyed your review. I would probably be crying! Me neither. It certainly makes you emotional.